Air Conditioning Repair New Braunfels: Are You Experiencing An AC Emergency? Are You Experiencing An AC Emergency? During these hot and humid summer months, you’ll want to ensure that your air conditioner runs smoothly and efficiently all season long. But sometimes, you might experience an AC failure of some kind. 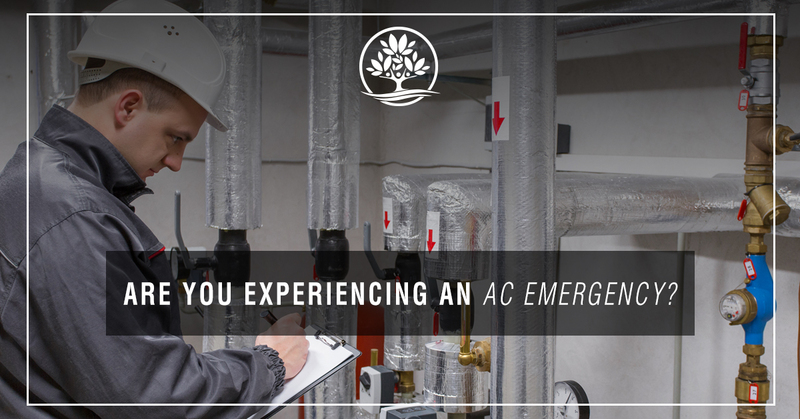 This can be a stressful situation, but is it really an AC emergency? Legacy Services has been serving New Braunfels for more than 30 years and in that time we’ve helped repair hundreds of thousands of air conditioners in any state of disrepair. After all this time, we know what constitutes an AC emergency. Learn to make the distinction here and if you are in need emergency air conditioning repair, give us a call. We offer 24-hour servicing. What Constitutes An AC Emergency? In Texas, any time the AC is off might be considered an emergency by some, but really it’s just a minor inconvenience. What escalates an inconvenience to an emergency is based on the factors of comfort and safety. For instance, if your AC breaks down and your a little uncomfortable, but can wait for normal business hours to make an air conditioning repair call, it’s probably not an emergency. However, if your AC cuts out in the middle of a scorching heat wave, you’re likely experiencing an AC emergency. Similarly, you have to consider the safety of you and your family. If your AC is leaking refrigerant, this can expose your loved ones to dangerous and harmful chemicals. A leak can affect the quality of the indoor air of your home. Family members with allergies or sensitive lungs might suffer from this decline in air quality. Legacy Services air conditioning repair has already covered some of the common AC problems in our three-part blog series, but they might make another appearance in your AC emergency. Here are some signs to look for before calling for our AC repair service. A screeching sound coming from the heart of your AC could be something as innocuous as a loose fan belt, or it could be a more dangerous problem. Your compressor may be running at extremely high levels of pressure. This could result in your AC breaking itself apart, and may pose a threat to anyone nearby. If your AC is making unusual noises, it’s best to shut it down and give us a call. If your AC won’t turn on, won’t move any air, or suddenly stops cooling the air it’s circulating, your air conditioner might be experiencing a major system failure. With so many problems and failures that can cause these problems, it’s often impossible to determine what has gone wrong without the help of a specialist. One of the best parts of using an air conditioner is that it filters out many of the particles that float freely in the outside air. The result is that cooled air in your home is cleaner and fresher. However, if you begin to smell a strange odor, and it’s not the family dog, it might be your AC. If you’re starting to smell a burning scent, this might be an electrical component of your AC failing. If this is the case, shut your air conditioner off immediately, and call an air conditioning repair technician right away! If you’re experiencing an AC emergency, don’t hesitate to call us right away. We offer 24-hour repair services so you can maintain your quality of living without interruption. Call now!